Dillsboro is a community located just 3 miles from the Dearborn- Ripley County line on US Highway 50 and 1 1/2 miles south of the Baltimore and Ohio (CSX) railroad. Dillsboro’s potential lies in its proximity to major transportation hubs and workforce training centers. This small town is home to 1327 residents who enjoy the library, parks, greenspaces, new sidewalks and drainage, curbside recycling and a new high-efficiency sewer plant. The town’s safety is assured by two fulltime police officers and a canine unit. 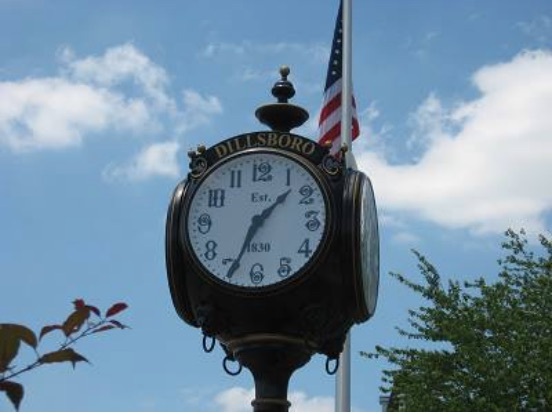 In 2015, Dillsboro was ranked as one of the safest communities in the tristate by Cincy Magazine. Heritage Pointe is the focal area of downtown Dillsboro. It features the town clock, beautiful landscaping and benches. Several annual events are held here: a Veteran’s Day program, Community Christmas caroling and it is a place of respite during the annual Homecoming Festival. Find out what's coming up all over town! Find a great business right here in Dillsboro. We'd love to reach out! Let us know how we can help. You'll just love our town!